It is summer and the days are already getting shorter, and yet the garden is just beginning to yield its bounty. I harvested the first sugar snap peas to add to a salad of arugula and white radish from the garden and fresh strawberries from a local farm. Fresh cilantro garnishes many of our meals; Swiss chard and kale, both easy to grow, are staples in many of our summer recipes. This year the broccoli is bolting rather than forming a nice head. The tomatoes look leggy, the beans are slow, and the peppers could use more sun. The first sunflower bloomed. So far this year the potato beetles and squash bugs and cucumber beetles are scarce. The potato plants are two feet tall and just beginning to flower. The leaves of summer squash, cucumbers, and winter squash look fresh and pest free. Deer flies and mosquitoes are doing well. Each year presents a different set of growing conditions. This year has seen a bit too much rain interspersed with a bit too much heat. Some plants and animals like it and some don't. Japanese beetles seem to favor any condition. They are just starting to emerge, mate, and browse plants in our yard. This marks the start of my early morning ritual to pluck the beetles off plants when they are still sluggish and drop them into soapy water. Each year I hope that moles and skunks consume most of the overwintering grubs, but every year the beetle population is just as big as the year before. I know where to find them though, as they have favorite plants: zinnias, goldenrods, raspberries, and the hazelnut bush. If I miss my morning beetle check and capture, then the population swells by the next morning. 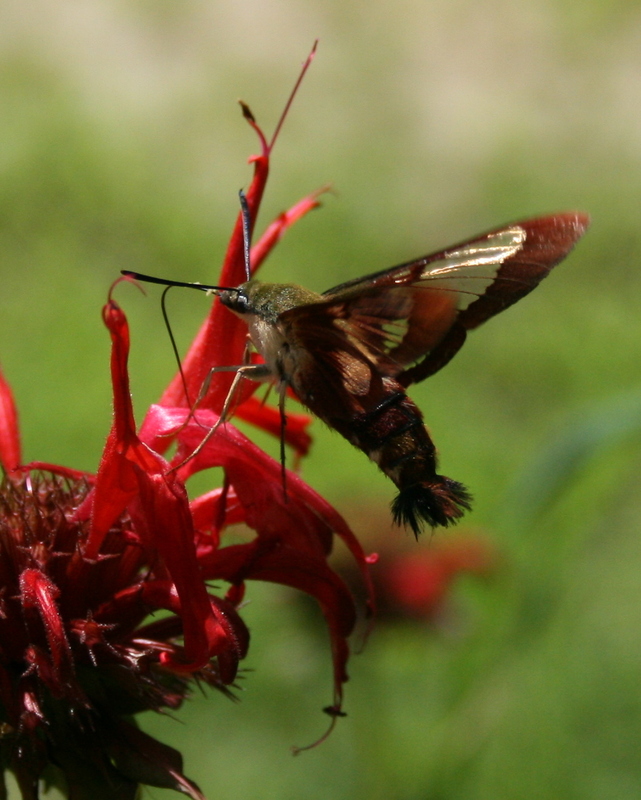 In our yard, red bee balm and purple lavender and pink astilbe are attracting pollinators. Spiders loiter in the potato plants. Chipmunks scamper along the fence, hide in the rock wall, and dig perfectly round holes in the yard. Nesting phoebes perch on the garden fence before sallying out for an insect to feed their young. Tree frogs trill in the evening. Our yard is alive with living things, big and small, and we welcome them all, mostly (Japanese beetles top my list of least useful denizens in our yard). I tend carefully to the annual plants -- the vegetables, zinnias, basil and other herbs. The perennial flower beds receive less attention each year. I let the wild milkweed grow and a patch of goldenrod is taking hold among the cultivated perennials. The backyard is wilder, which we let grow into cattails and sedges, goldenrods, asters, Joe-pye weed, and other wild things. It seems only natural to let things grow and spread and not fuss too much about what is where. During drought years the lawn is heavy to crabgrass. This year clover is thriving in the extra moisture. We do little to alter this year to year variation in the lawn's life, except to mow it every week or two. I do like a bit of lawn for ease of walking among the gardens and fruit trees and to the compost piles and garden shed. But too much lawn is unnecessary and a sterile lawn is unhealthy. After traveling for two weeks in the Midwest, driving past acres and acres of just corn and noting carefully tended weed-free lawns, it seems a marvel to have such a lush landscape surrounding us here in New Hampshire. We cherish the diversity in our yard, some cultivated and some wild. 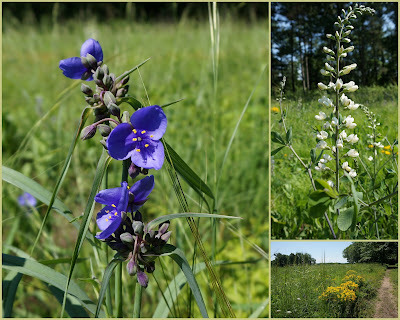 Healthy soils, clean water, clear air, and a wild mix of insect predators, prey, and pollinators yield delicious food, beautiful flowers, juicy peaches, handfuls of blueberries, pungent herbs, and a good life. For the past two weeks my folks and I have travelled 1,400 miles through parts of Wisconsin, Iowa, and Illinois. On our travels we've driven by a lot of cornfields, especially in Iowa. Last year Iowa farmers grew 1.8 billion bushels of corn on 13.7 million acres. So, there really is a lot of corn in Iowa. Each acre of corn produces about 172 bushels. Corn is selling at $6.88 a bushel as of today; two years ago it was $3.41 a bushel. You can see why farmers are growing a lot of corn and you can see why the value of an acre of farmland is over $6,000. Farmers usually rotate fields between corn and soybeans, although we saw far fewer fields of soybeans. This, despite "bean" prices of over $11 per bushel. 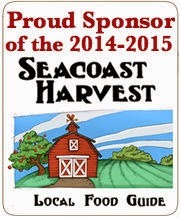 However, soybeans yield only 50 bushels per acre, so corn remains the favored crop to plant. Our route through Iowa took us to the Ames and the home of Iowa State University, where I attended graduate school and met Srini. The town and campus have grown considerably since we left in 1988. Today there are many more campus buildings, wider roads through campus, housing developments where there were once hog farms, and campus town, where we used to hang out, seemed seedier. I liked it better 25 years ago. We crossed the mighty Mississippi River in Burlington, Iowa, after a brief tour of the historic downtown set on the river bluffs. As with many such places, the downtown has lost much of its economic strength of years gone by, and now expands westward with more hotels, chain restaurants and shops, a casino, and other less interesting attractions (in my opinion). The natural setting of this town seems lost to a new era. Leaving the Mississippi River behind, we headed to Springfield, Illinois to visit relatives and to tour some of the Lincoln historic sites. We toured the Lincoln Museum that includes full-scale replicas of Lincoln's boyhood home and the White House. The museum offers plenty of history lessons and life-like reenactments. As with most such attempts at making history interesting to visitors, sometimes the stories are simplified or re-cast in 21st century style, not favored by some critics. We spent nearly 3 hours there and enjoyed it all. My Dad's family is from south-central Illinois--a place we visited often as I was growing up, especially during the hot, humid days of July and August. By late summer the corn would be over our heads, as tall as small trees when you are a kid. This is the first time that I remember visiting in June, when the corn is not yet knee-high. Dad inherited a few acres in the small town of Modesto (population 300 or maybe 100). Rather than grow corn, he has rented the field to a local farmer to grow alfalfa, helping to diversify the crops to benefit birds, pollinators, and soil health. huge, round bales, amidst a sea of corn. Our midwest tour is coming to an end. We've seen cranes and corn and capitols, crossed big rivers, traveled back in time to visit graves of grandparents and Civil War era sites, driven through the bluff country along the Mississippi River and across the pancake-flat farmland of central Iowa. It takes time to appreciate the subtleties of this territory, the small undulations in topography, the vast expanses of treeless land. I still wonder about the near complete transformation of this once tall grass prairie to a monoculture of corn and to industrial agriculture. At the same time, I'm uncertain how we as a nation could change the way this land is now managed. That will take a new era. The "Driftless Area" covers 16,000 square miles in parts of Minnesota, Wisconsin, Iowa, and Illinois. It is so called because the most recent glacier that receded about 10,000 years ago missed this area. Therefore, the limestone bluffs and talus slopes escaped the grinding action of the ice sheet which turned rock into "glacial drift" elsewhere. Hundreds of small cold-water creeks, some home to native brook trout, flow down through deeply carved limestone bluffs to the Mississippi River and its tributaries. As cold warm seeps down through the soluble limestone and sandstone bedrock, caves, sinkholes, and underground streams form. We visited one such small ice cave in the scenic Town of Decorah, in northeast Iowa. Our travels through the Driftless Area took us along scenic Route 60 as it follows along the north side of the Wisconsin River. We crossed the Mississippi River in Prairie de Chien, Wisconsin over to Marquette, Iowa. North three miles on an equally scenic Route 76, we stopped at Effigy Mounds National Monument. About 1,400 years ago local Indians began to build effigy mounds, thought to be religious sites or clan symbols used in seasonal ceremonies. The mounds are of low relief and in the shapes of animals, often bears. The mounds are best seen from above, so some suggest that perhaps these formations connected people to their land and the spirit world. There is still much mystery surrounding the purpose of these mounds. 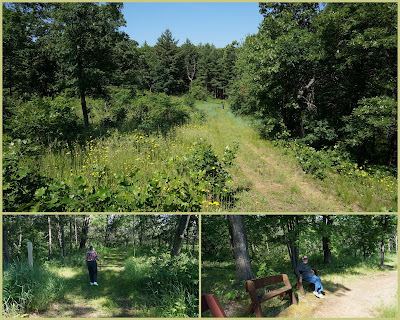 We did not have the time or group stamina to spend much time here, but there are rugged hiking trails that lead to many of the effigy mounds and excellent views atop the bluffs overlooking the Mississippi River. After a night in Decorah, Iowa (and a dinner of paninis at Happy Joes) we drove southwest toward Waterloo and then on to Ames. The wooded bluffs and steep valleys gave way to flat expanses of what was once prairie and is now corn and more corn. The cornfields in much of Wisconsin were more than a foot tall, whereas most of the fields that we passed in Iowa were just getting planted. Heavy rains in May and June seemed to have wiped out the first attempt to plant corn and soybeans. Between Waterloo and Iowa we saw another land use plopped in the midst of planted fields--wind turbines. In 2012, Iowa generated 24% of its energy from wind. We passed a 100-turbine wind farm located northeast of Ames, the giant blades were turning slowly in light wind. Several smaller groups of turbines were visible along our route. The turbines are huge and visible, but I did not feel in this landscape that they marred the view. Rather, it reduced the monotony of the corn rows. 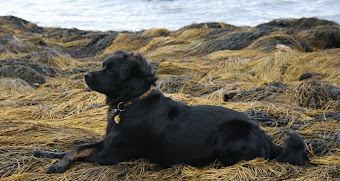 of the landscape, in a patch of grass or prairie or alfalfa. We left Baraboo behind yesterday morning, driving south on Route 113 passed acres and acres of corn not quite knee high. In the small Village of Merrimac, Wisconsin (population 420), Route 113 crosses a wide section of the Wisconsin River to the Town of Okee. Since 1848, a ferry has shuttled Rte 113 traffic across the river. In the early days, passengers were charged five cents, horses cost 25 cents each, and a team of oxen was 75 cents. The State of Wisconsin took over the ferry in 1933 and the ferry has been free to people and cars every since, operating 24 hours a day, seven days a week from April 15 to November 30. I am always reminded of and impressed by how much more recycling occurs in the Midwest than back home in New England. At the ferry landing, this small village has a row of recycling bins for aluminum, brown glass, green glass, clear glass, plastic, and tin, along with two trash bins and free public rest rooms. After the fun ferry crossing we pushed on south to Madison, to the Olbrich Botanical Gardens. Unfortunately it was closed for a fundraiser, so I Googled our next destination -- the Wisconsin State Capitol. We had only planned a drive by, but now had time for a full visit. The Capitol square was bustling with visitors and shoppers to the weekly Saturday Farmer's Market that lined the sidewalks surrounding the building. The Capitol building is ornately decorated with murals, 43 types of stone from around the world, hand-carved furniture, paintings, and with the only granite dome in the country. And my favorite sculpture -- the Wisconsin badger! By now it was lunchtime and after a bit of driving to and fro we found Olin Park on the shores of Lake Monona in Madison. We enjoyed a picnic lunch under a huge burr oak tree. We've had two spectacular days in a row, weather-wise -- blue sky with puffy white clouds and temperatures in the mid-70s -- as we travelled from Geneva, Illinois to Baraboo, Wisconsin. Our travels took us on Interstate 90 and on smaller highways and back roads, the latter being the most preferred. This is the land of cornfields, farm ponds, small woodlots, prairie remnants, gently tolling topography, low wooded hills, and wide open spaces in between sprawling cities and less prosperous small communities. My parents and I spent yesterday in Baraboo, Wisconsin at two special places north of the town proper: the Leopold Center and Shack and the International Crane Foundation. In 1935, Aldo Leopold bought a worn out farm on the Wisconsin River and brought his family there on weekends from Madison. They set about fixing up the "shack" and restoring the land from past abuses and the ravages of the 1930s drought. Leopold was a forester, conservationist, writer, and keen observer of the natural world. He wrote, Game Management, the first textbook in the new field of wildlife management. A year after his untimely death in 1948 while fighting a wild fire on his neighbor's land, his book A Sand County Almanac was published. Leopold wrote profoundly about the relationship of people to the land and the importance of a land ethic. The Aldo Leopold Foundation carries on Leopold's legacy, furthering his ideas of a conservation ethic, land health, and managing lands holistically. The Leopold Center includes "the shack" and trails as well as an education center. It is a rustic, low-key site with many trails and opportunities for personal observation and reflection, just as Leopold would have done seventy years ago. After our morning visit to the Leopold Center we drove in search of a picnic area, in particular a place near Baraboo called Man Mound County Park. The last time that I took a long road trip with my parents was in 1984 and on that trip and every one before that stretching back to my toddler days, we always stopped for picnic lunches. So, I packed a table cloth for this trip, anticipating these lovely midday lunches. We searched to no avail for Man Mound, but found a wide shady spot in the road not far from the Leopold Center and enjoyed a picnic lunch. From there, it was a short drive west to the International Crane Foundation on Shady Lane in Baraboo. This facility, tucked into rolling prairie and woodland, is dedicated to the conservation of all 15 crane species in the world. The ICF is a leader in the captive rearing of the endangered whopping crane, one of two native species found in the United States, and the most endangered crane in the world. Thanks to the work of this group, the species is expanding and a wild pair is now nesting in Wisconsin. A visit to this site is a must. It is the only place in the world where you can see all 15 crane species and wow are they beautiful. 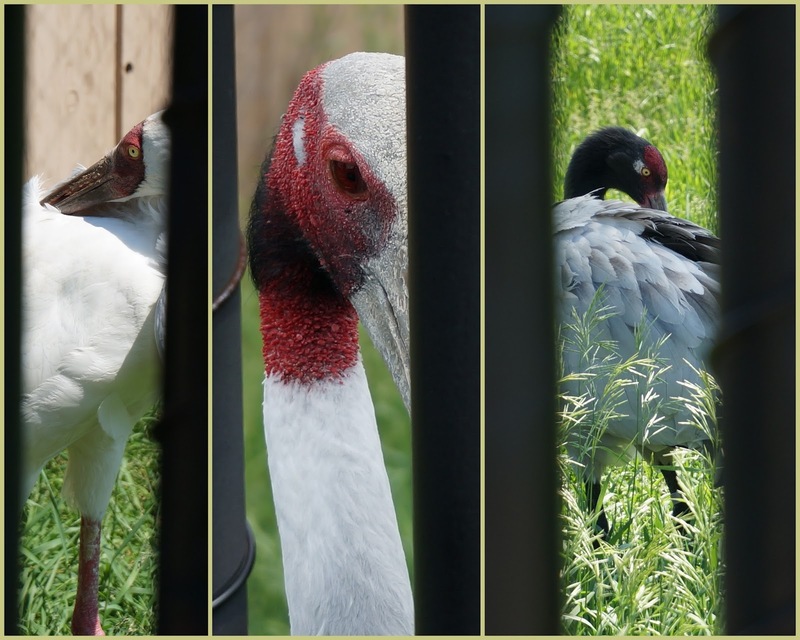 We walked the paved pathway past outdoor exhibits of African cranes, around the "Johnson Pod" that houses another half dozen pairs of crane species, and the whopping crane exhibit that includes an active nesting pair that you can watch up close. The Spirit of Africa exhibit is home to four species of cranes. Their outdoor pens are a mix of wetlands and grasslands -- the natural habitat of cranes. Here are the four species of African cranes. One of my favorite was the White-Naped Crane, native to the far east. The Whooping Crane exhibit, where a captive pair attends to a nest. while the female was off fishing and preening. By the 1940s the whooping crane population was down to just 15 birds and today there are nearly 600 birds thanks to the conservation efforts of the International Crane Foundation and its partners. There are two distinct migratory breeding populations of whooping cranes. One group nests in northwestern Canada and migrates to the coast of Texas. The other population nests in central Wisconsin and flies to the southeastern U.S. for the winter. These birds had to be taught initially to migrate by following an ultralight powered by a human dressed in a crane costume. The young birds assumed they were following their parent. Once on their wintering grounds they were then able to find their own way north in the spring. A small, non-migratory population was also established in central Florida and coastal Louisiana. The cranes species of the world number only 15. All are graceful, beautiful birds in need of our stewardship and care across the five continents on which they breed and migrate. The International Crane Foundation continues to lead the effort. On the drive back to the hotel we made one last attempt to find Man Mound County Park. Our perseverance paid off and we found this tiny pocket park, the site of an effigy mound in the shape of a huge man. It is thought to represent a powerful Indian spirit, perhaps dating back 900 years ago.